It’s the end of 2012, time for best and worst lists. Because soaps are in such danger and I’ve already recorded most of the worsts in the weekly column I’m choosing only to do the bests here. And Marlena being Marlena sometimes I have multiple choices in each category. 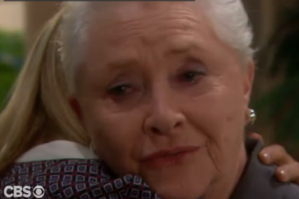 Best Actress: The Bold and the Beautiful’s Susan Flannery. Can there any other? Her work in the month leading up to Stephanie’s death was just so human and full of intelligence, two full career-long defining traits of arguably daytime’s best ever actress. Best Actor: Doug Davidson, The Young and the Restless. Tragedy usually becomes soap performers, but it’s still difficult for some actors to pull off crying scenes believably and effectively. Y&R‘s Doug Davidson was just grand as the drowning-in-guilt Paul, who shot and killed his own son, when Ricky was about to commit murder. Davidson was just so realistic as a father in this ultimate pain, especially when he was unjustly arrested for Ricky’s murder. Best Supporting Actresses: Too many to choose just one. B&B ’s Katherine Kerry Lang should get the Emmy she deserves this year as Brooke for that character’s loving support of Stephanie on her deathbed … Kelly Sullivan has just been terrifically entertaining and often hilarious as Crazy Connie on General Hospital. (She also plays Connie’s alter, fashion editor Kate.) … Will’s coming out scenes on Days of Our Lives wouldn’t have been half as effective if not for the understanding and support of his grandmother Marlena. Deidre Hall, as ever, is brilliant as a character who represents the ultimate in womanly love and acceptance … Robin Mattson was just deliciously evil as always when her crazy, cunning Heather returned to GH, bringing with her a swath of misdeeds, including a role in the switch of Tea and Sam’s babies. Best Supporting Actor: General Hospital ‘s Jason Thompson was every bit as good in crying scenes as Y&R’s Davidson, as Patrick so heartbreakingly mourned the death of his wife, Dr. Robin. The exquisite sensitivity the character showed in his grief was totally unexpected. Best Couple: Anna and “Duke”/Faison on GH. In the 80s they were a supercouple — Finola Hughes and Ian Buchanan had amazing chemistry, and their great acting skills beautifully complimented one other. And they stayed a dazzling duo when both returned this year to GH and played out the twisty and shocking Faison-is-the-fake Duke story. The actors also did just as great work apart: Hughes as Robin’s grieving mother on GH and Buchanan as the scheming meanie Ian on Days, who also wildly grieved when his love Madson died in his arms. Buchanan is this soap year’s prince of melodrama. Best Show: General Hospital, for making the comeback of the year. A year ago, the smart money bet this show would be cancelled. But executive producer Frank Valenti and headwriter Ron Carlivati turned the tide splendidly, transforming GH into such a highly entertaining show that fans don’t want to miss even one day! May GH’s rising ratings portend a new era of success for dayime soaps! Cher readers, do write in and tell me your personal bests for 2012. Also, listen to Connie/Marlena chat about soap bests and the biggest soap news events of 2012 with soapcentral.com’s Daniel J. Kroll on http://www.voiceamerica.com/Show/1661. Divine: Nikki and Victor’s long embrace, promising each other to rebuild among the ruins of the Newman ranch, all set to The Young and Restless theme (Nadia’s Theme). I love this traditional soaps move, playing a crucial plot moment for their lead characters or couple against the theme music of the show. It is such a mood moment, in this case such a romantic and a greatly grounding one for two characters who have endured so much together and always come through. A very nice touch by the show’s new production regime. General Hospital: “No one ever dies in this town,” exclaimed Luke and Tracy together as they talked about the wounded and missing Joe Scully Jr. on Friday’s episode. Don’t you just adore when soaps make fun of themselves? Because back from the dead has certainly been endemic lately on GH. 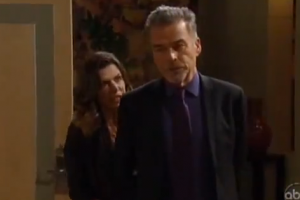 Last week, one of the most thrilling back from the dead story scene reveals I have ever seen was when Duke Lavery (Ian Buchanan) presented himself to disbelieving wife Anna Devane (Finola Hughes) as being alive after a 23-year absence. His declarations of continuing love for her (complete with flashbacks) were the most romantic and intense scenes of the soap year so far. You know (see Soap Reflections 6) that I am just a marshmallow for the ever handsome, divinely British accented Buchanan. And Hughes should win an Emmy for her portrayal of silent disbelief slowly turning to a burgeoning sense of joy the character felt reuniting with her long lost husband. Didn’t you just love the welling of tears in Anna’s eyes, the moment she realized he really was Duke and the two a rushed into each other’s arms in a reunion embrace? That’s good writing, electric chemistry (still strong after 23 long years) and great acting! Again, as in the last week, the writers of GH proved how expert they are at weaving great storylines together in single episodes. The week also featured Jason finally telling Sam that her baby son was alive and concluded when the two found kidnapper Heather clutching their baby son in her arms on the hospital rooftop. Spine-tingling! No one plays “crazy pants” better than veteran actress Robin Mattson. Too bad the previews of Monday’s episode gave away that Heather does jump off the roof (sans baby, I’m guessing). Why should a show usually so careful about disclosing its storyline secrets permit such a big boo-boo? Marlena just loves suspense that is unspoiled. Thinking Fans Comment Update Sept. 30: Matthew Cormier wonders why Stephanie is so jealous of Brooke … jefhamlin says it all started with Beth Logan … and Cherry Ames says the marvelous Susan Flannery almost makes her want to watch B&B, but not quite. See Comments below. Soap operas are unique in their ability to slowly portray a character’s bad behaviors, tragic downfall, and ultimate redemption. But lately I’ve been troubled by the vehemence of the anger, blame, and finger-pointing OFF screen. We have all recently seen actors, producers, anonymous bloggers and even journalists engage in attack, blame, and judging. My feeling is that many are ignoring the most consistent and essential thread in the soaps’ history: Good people do messed up things when they are afraid. If someone is in pain or insecure, they are more likely to lash out at others than to ask for help. They deserve empathy and understanding, not attack. Case in point: Stephanie Forrester. On paper, The Bold and the Beautiful should be the most solid show on daytime. The show was created by daytime legend Bill Bell and taken over by his son Bradley when he retired. In an era in which shows seem to change creative teams with the change of seasons, Bradley Bell has been head writer and producer for well over a decade.